Fully-hardy small tree with ovate tapered leaves and double white flowers in spring. To 6m. [RHSD, Hortus, Hilliers']. The variety ‘Rhexii’ has double white flowers and has been in cultivation since the 16th century. [Hilliers', Hortus]. This is probably Macarthur’s plant. ‘In hedges, thickets, and on bushy slopes. Local and rare, except in the South of England. It occurs in the counties of Cornwall, Devon, Dorset, Hants, Sussex, Kent, Surrey, Bucks, Essex, Cambridge, Salop, Pembroke, Denbigh, Leicester, Cheshire, and Cumberland. This shrub bears much general resemblance to P. Avium, but the mode of growth is quite different, being a bush with numerous much-branched stems ; the bark is redder, the leaves stiffer, more shortly stalked, shorter, generally not above 3 or 4 inches long, less abruptly pointed, more finely and more unequally serrated, every second or third tooth being twice or thrice as deep as the others; the veins are also less downy beneath. Peduncles stiffer, and consequently not drooping. Flowers rather larger and more open. Calyx-tube more open at the mouth; segments broader, blunter, and serrated. Petals less notched. The fruit I have not seen, but it is said to be "subdepresso-globose, scarcely cordate, red, juicy, and acid." (Bromfield, El. Vect. p. 146. 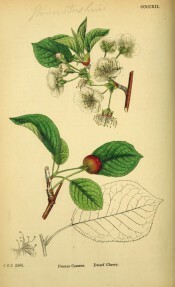 )’ [English Botany p.123, pl.CCCCXII/1863-86]. The plant described and figured, and used as illustraton here, is the single-flowerd form. Listed in all published catalogues [T.781/1843]. Prunus cerasus semi plena is marked with a ‘c’ in an 1836 edition of Loddiges’ catalogue held at Camden Park [CPA]. In William Macarthur’s code, used and explained elsewhere, this means grown at Camden. It is almost certain that it was grown in the gardens around this time but it did not appear in the catalogues. I have found no other reference to semi plena and it may be the flore pleno of the catalogues. Prunus cerasus Scop. (1771) = Prunus avium (L.) L.
Prunus cerasus L. | English Botany p.123, pl.CCCCXII/1863-86 | BHL. The illustration is of the single-flowered not double-flowered form.